Place the first 8 ingredients in a food processor and combine until everything is well integrated. Stop the processor and use a spatula to scrape the sides. Process again and repeat these steps two more times to make sure all the ingredients are well combined. While the processor is running, slowly add the olive oil. Pour slowly so that the stream is about as thin as thread. Taste and adjust the seasoning to your liking, you can add more salt, pepper or lemon if you like. Sprinkle with fresh cheese if you like and serve with pita bread or chips. 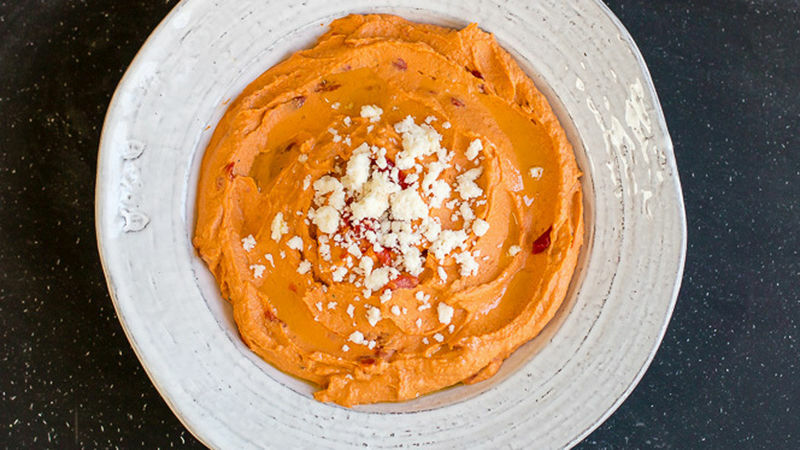 You can keep this hummus refrigerated in a container for up to one week. I must confess that I absolutely love hummus. Ever since I learned to prepare it hummus can always find it in my fridge. I eat it with everything: sandwiches, tortillas, chips, etc. It's perfect for any reunion when served with pita bread or crackers. This version with roasted peppers is one of my favorites. Cayenne peppers give the mixture the perfect spicy touch. Enjoy!